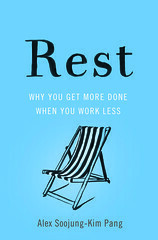 One of the most surprising discoveries I made while writing REST was how many of my subjects– Nobel laureates, famous novelists, artists, scientists, and others– were athletes. I had grown up seeing athletes and scholars as two different tribes: in my high school, they formed distinct social groups. Indeed, they were mirror worlds: being a jock meant not taking your grades seriously, and being academic meant holding the whole sports scene– the Friday night lights, pep rallies, varsity jackets, etc.– with barely-disguised contempt. Novelist Haruki Murakami has a fine short book, What I Talk About When I Talk About Running, about the relationship between his development as an athlete and as a writer. Murakami had written two books while managing a jazz bar in Tokyo, and had worked on them very late at night, after the bar closed; but he realized that this would be unsustainable, and that he wouldn’t mature as a writer if he kept working this way. So he sold the bar, moved to the country, and became a full-time novelist. Writing itself is mental labor, but finishing an entire book is closer to manual labor…. The whole process— sitting at your desk, focusing your mind like a laser beam, imagining something out of a blank horizon, creating a story, selecting the right words, one by one, keeping the whole flow of the story on track— requires far more energy, over a long period, than most people ever imagine. Sometimes I run fast when I feel like it, but if I increase the pace I shorten the amount of time I run, the point being to let the exhilaration I feel at the end of each run carry over to the next day. This is the same sort of tack I find necessary / when writing a novel. I stop every day right at the point where I feel I can write more. Do that, and the next day’s work goes surprisingly smoothly. This is the important thing for long-term projects. Once you set the pace, the rest will follow. The problem is getting the flywheel to spin at a set speed— and to get to that point takes as much concentration and effort as you can manage. This practice turns out to be a common one, and a critical one. Stopping at just the right point, so you have both the energy to continue writing the next day and know what you’ll write first thing in the morning, is a key piece of deliberate practice that people who work on big, complicate projects that take a long time often develop. Most of them don’t come to it naturally: earlier in their creative lives, their habit is to work until they’re exhausted, then start the next day with a blank page and no idea what to say. They learn through bitter experience that it’s better to pace yourself, that creative projects are marathons not sprints. This is also true of other cognitively-demanding pursuits. Chess, for example, is not longer the dominated by the chain-smoking Russians I watched play during the Cold War. In recent decades, the game has become more challenging: prizes are bigger, computers let you practice more intensely, and games have gotten longer and more involved. To be a world-class player, you now need to be able to concentrate at a high level for several hours. And that requires a physical stamina that only comes from being in great physical shape. More generally, I’ve made me rethink my assumptions that creative work is all mental and not also physical, and that creative life virtually requires a renunciation of the body. Mortification may be good for saints, but it’s not good for scholars. To really do great things, you need a body that can meet the challenges of creative work. To create a body of work, you need a body that can do the work.